OK, then perhaps you should work on your delivery. It comes off very well as sarcasm. ... and we don't, unless we want to. And because it's not NCOWS, nor a requirement. 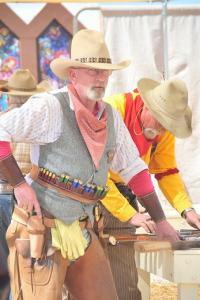 But feel free to petition for a Black Powder Classic Cowboy category if you want to jump in. But there's plenty of Classic Cowboy that do shoot black because that's what they did. Yeah, and they cauterized wounds with a branding iron. What's your point? 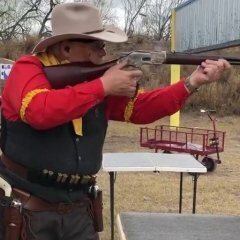 We shoot the sport of “Cowboy Action Shooting”. Nothing represents the essence of our sport more than “Classic Cowboy” (B-Western notwithstanding). To me, the “Cowboy” in this sport is that Civil war vet who, after the war went west to find a new life with his only possessions on his back or in his saddlebags and found work dragging trail on the Goodnight-Loving Trail and then later on the Chisholm Trail. He is the ranch hand that “Rode for the brand” for the cattle baron who had a big ranch and a good herd. Classic Cowboy is an homage to those hard men who led a hardscrabble life on the back of a horse for twenty five dollars a month and found. You could say that Classic Cowboy is a way for those few short hours on weekends to live vicariously, the lives of those characters in the novels of Luke Short, Max Brand, Louis L’Amour, and others. 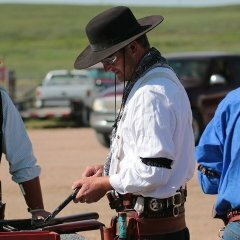 In shooting “Classic Cowboy” we respect the notion of some of the above reasons and choose a more difficult path in our game by wearing those heavy pair of chaps, putting on those Lindholm spurs, finding your Grandfather’s pocket watch and putting it in your vest, wearing the suspenders, wild rag, and getting the big knife. Then we’ll shoot the big bore because a real cowboy wouldn’t be caught in public with a .38. And because we love a challenge, we’ll do it one handed to boot. Just to see if we can keep up with you. We’ll do it in the summertime; we’ll do it in the wintertime, because that’s what they did. But after shooting “Classic Cowboy” for a number of years, I probably found that the best reward, was not only the afore mentioned points, but it is the camaraderie and respect that develops over time with fellow shooters of the “Classic Cowboy” category. Oh sure there is. It's called the .45 Schofield 1.28" Straightwall Express. Howdy Bandit, Go to SASS web site seardh Michigan clubs, select Wolvering Rangers, then select merchants and look for Redbeard Bandit, Must be some sort of kin of yours, Ha ha ha. I been shooting his and there great. Just thought you might like to know.